Morrell Sanctuary is 278 acres of beautiful forest with 11 km of trail systems. You can hike through this park to Westwood Lake on the other side, to combine the two hikes into a longer one. Located in South Nanaimo near VIU and Colliery Dams Park, Morrell is a lush, forested park with a lot of life in it. There's a small lake where you can feed the birds, a picnic shelter by the lake, a beautiful rocky viewpoint above the forest, and a beaver pond with wooden viewing platforms – surrounded by Douglas firs. 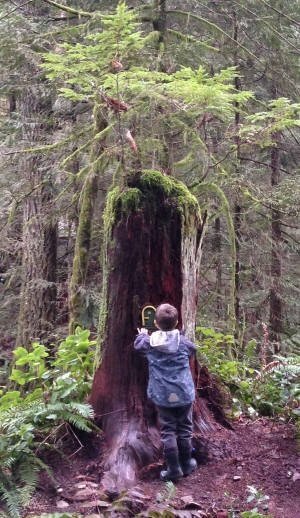 The Yew Loop trail is perfect for children, as it's a short hike with several "gnome houses" built into large stumps and trees. The entire park features trailside interpretive signs which add to the interest of the place, and its educational value. The photo below shows my friends and my son when he was a toddler, near the picnic shelter at Morrell Lake. About two minutes after I took this photo, my friend picked up my son and came over to me, hissing "GERRY - BIG CAT!" Indeed, there was a cougar about 30 feet away from us, pacing and looking at us, staying behind a stand of trees. I picked up a large log and THWUMPED the ground and nearby trees, yelling like a madman and singing opera - but the cougar seemed unphased! Eventually it decided to leave, thank goodness. I carried my kid all the way out of that park. So - be careful with your children in there! I should note that there is a wonderful daycamp in the summer at Morrell, and I DO send my kid (who is now 7) to that daycamp. So I don't want anyone thinking the park isn't safe. Cougars are dangerous but proper precautions will manage the risk.